The year is moving fast forward and with just two months left this year, the Holiday Season is around the corner. These are important days for e-commerce companies to realize additional sales. To make sure you don´t miss out on the extra expenses of potential customers, it´s important to be well prepared. What are the days to think about for ecommerce promotions? And how do you stand out from the competition? Keep on reading and we are happy to share our insights. From November onwards, there are various special promotional days and holidays that customers look forward to. This starts with Black Friday and Cyber Monday at the end of November and continues in December with Christmas. 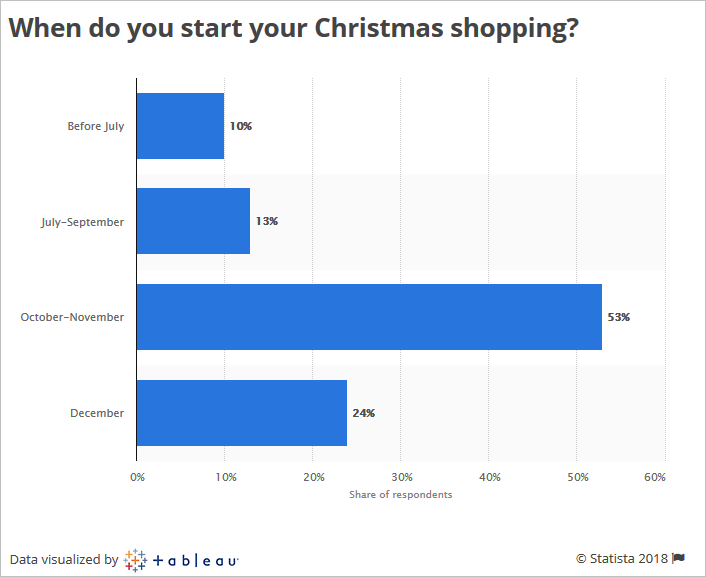 According to research by Statista, the majority of English people buy the gifts in the months October, November and December. So don´t be too late with the preparation of e-commerce promotions and make sure that your webshop is ready for the holiday purchases. And don´t forget to already program your social media channels with posts focused on these days. The concept of Black Friday may come from America, but nowadays it is also a well-known concept in The United Kingdom. According to The Guardian, the sales from Black Friday in 2017 in the UK were even higher than the year before. Black Friday is held on the day after Thanksgiving, which is celebrated on the fourth Thursday in November. For e-commerce promotions you can think of special discount codes for this day. Clearly communicate them, for example on your website and in your Adwords campaigns, so that customers know they can benefit from your special offers. Cyber Monday – the first Monday after Thanksgiving Day – is a day specifically aimed at online stores. Where on Black Friday also physical stores offer discounts, on this day the discounts offered online are taking first stage. Take advantage of this. You can extend your discount code of Black Friday for example or create a new discount code especially for this day. It is well known that the holidays can cause stress in people. They have to buy gifts, come up with a Christmas dinner and go shopping for the menu, and in the meantime, maybe also have work to complete and a family to take care of. If you can take a burden off their shoulders with your product or service, you can distinguish yourself from the competition. For example, if you have a gift idea for under the Christmas tree you offer extra free time and make sure that someone doesn´t have to walk through a shopping street for hours to find the perfect gift. By clearly communicating that people can order online and the product is delivered on time for the holidays, you increase the chances that potential customers will make a purchase at your online store. See if you can offer extra fast delivery like same-day-delivery during the holidays. This way you prevent stressed customers who are waiting for their package. You can also pay extra attention to the holidays on your blog. For example, you can write a post with gift ideas from your webshop. You can also apply the approach to offer inspiration to other sectors, such as online clothing stores. For example, create the ultimate Christmas look that people can shop on your website. The months of November and December offer many opportunities for e-commerce promotions for your webshop. Take advantage and go for that extra turnover at the end of the year. Do you need help to ensure that your webshop stands out among the competition? Don´t hesitate to contact us! PreviousPrevious post:SEO content writing: discover our tipsNextNext post:Collecting email addresses: how do you increase your database?